The Sturgis Police Athletic League (PAL) is raffling a 2015 Harley Davidson Sturgis Police Edition FLHTP motorcycle. Tickets are $20 each or 3 tickets for $50. The winner will be announced on Saturday August 11, 2018 at Harley Davidson Rally Point during the Rally Closing Ceremony. The motorcycle can be seen at the Sturgis PAL Booth at Harley Davidson Rally Point. Tickets will be sold daily during the rally from 9:00 AM to 6:00 PM. Tickets can also be purchased on-line at sturgispal.org. Winner need not be present to win. Winner will be responsible for any shipping charges if the motorcycle is to be shipped anywhere. Winner is also responsible for all taxes and licensing. 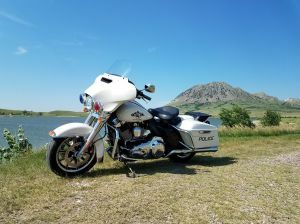 Proceeds from the raffle will benefit the Sturgis Police Athletic League (PAL) and the recreational and athletic activities offered to the youth in the Sturgis Community.